An MRI scan is a type of test you can have to produce detailed images of the inside of your body. It uses powerful magnets and radio waves to create these images and is often used to diagnose or monitor a condition. MRI stands for magnetic resonance imaging. An MRI scan can be used to look at almost any part of your body. It uses radio waves and a magnetic field to create images of the inside of your body. The images are very detailed and taken in thin ‘slices’ through your body from various directions. It can be used to detect lots of different problems in different areas of your body such as inflammation, tumours or damage such as a broken bone. It’s particularly good at looking at soft tissue such as breast tissue, and organs such as your brain, liver and heart. MRI scanning can also be used to examine your blood vessels, nerves and muscles. Some MRI scans are done using a special dye, known as a contrast medium. This will depend on the area which needs to be scanned and why. The dye is injected into your body and helps to produce more detailed images. Tell your radiographer if you have any allergies before the scan. An MRI scan can often show things that can’t be seen on an X-ray or in other tests such as an ultrasound scan. Unlike X-ray machines and CT scanners, an MRI scanner doesn’t use radiation. An MRI scan has many benefits but it isn’t suitable for everyone. The magnetic field from an MRI scanner affects some metals, including those used for surgical clips or pins. So if you’ve had surgery which left metals inside your body, it’s important to tell your radiographer. This is because the magnets can make the metal move and could affect nearby tissues. If you’re pregnant, you won’t usually be offered an MRI scan, especially during the first three months. But there’s not enough evidence to say for sure if the magnetic field of an MRI might affect your unborn baby. So if you’re pregnant or think you may be, tell your radiographer before your MRI appointment. If you need to have an MRI scan while you’re pregnant, the scan will be done in a way that reduces any risk to your baby. 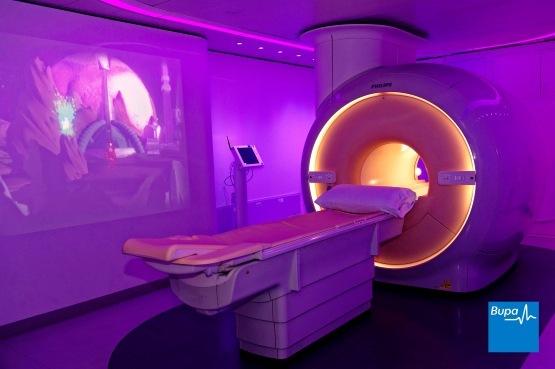 If you’re claustrophobic, you may find it difficult to have an MRI scan because the machine is shaped like a tunnel. If you’re claustrophobic, tell your doctor when they suggest you have an MRI scan. They may be able to arrange for you to have the scan at a hospital with an ‘open’ MRI scanner. You should also contact the hospital before the day of your scan to tell the radiographer who’s performing the test. For more information, see our FAQ on claustrophobia and MRI scans below. X-ray. An X-ray uses radiation to produce an image. Ultrasound. This uses sound waves to produce an image. Computerised tomography (CT) scan. This is a test that uses X-rays to create three-dimensional images of part of your body. Your doctor will discuss your options and recommend which test is the best one for you. Before having an MRI, you should be able to eat, drink and take any medicines as usual. However, some MRI scans may require you to stop eating or drinking in the hours leading up to your scan, or the opposite. For instance, if you're having a scan of your abdomen (tummy) or your pelvis, you may be asked to drink extra fluids before the scan to help your stomach and bowel to show up better on the scan. If you wear stick-on medicine patches, you may need to remove these before having an MRI scan, so take a spare one to the hospital. This is because some patches contain metal and may heat up. At the hospital, your radiographer will ask you to complete and sign a safety questionnaire. You’ll be asked if you’re pregnant or have any medical conditions. You’ll also be asked if you have any metal or electronic implants as these may cause problems during your MRI scan. Your radiographer will go through a checklist of metal items that you might have inside your body. If you’re not sure whether or not you have any of these, you may need an X-ray before your MRI scan to check. Having something metallic in your body doesn’t necessarily mean you can’t have an MRI scan. But your radiographer does need to know, so they can make the right safety decisions. Before you go into the scanning room, you’ll probably be asked to undress down to your underwear and put on a hospital gown. If you’re wearing an underwired bra, you may need to remove this too, as the underwriting usually contains metal. You’ll also need to remove any jewelry (including piercings) or metal objects such as hairclips, your watch or dentures with metal parts. You may need to remove your glasses and hearing aids if you wear them. You may also need to remove your make up, especially eye make-up, which can contain metal fibres. Tell the radiographer if you have any tattoos, especially if they’re on the part of your body that’s being scanned. Most tattoos are made of ink, but if you have a tattoo that contains metal, then it may need to be covered with a cold compress or ice pack during the scan. This is because tattoos can heat up if they contain any metal. Don't take any electronic or metal items, such as your keys, mobile phone or credit cards, with you into the scanning room. A friend or relative may be able to stay with you during the scan. They’ll also have to leave any metal or electronic items behind, and complete and sign a safety questionnaire too. If you’re having an MRI scan that involves using a dye (contrast medium), your doctor might need to inject this before or during your scan. The dye will help to produce more detailed images. Where it’s injected will depend on which part of your body needs scanning and why. You may need a blood test before your scan to check how well your kidneys are working. If your kidneys aren’t working well enough – for instance, if you have diabetes or heart failure or you’re taking medicines that affect your kidneys – you may not be able to have the dye. A very small number of people may be allergic to the dye. Tell your radiographer before your scan if you have any allergies. Young children and people with claustrophobia having an MRI scan may be offered a sedative or a general anaesthetic. This means they’ll be drowsy or asleep during the procedure, which will help them to lie still. When you go for an MRI scan, your radiographer will ask you to lie on your back on a table. The table slides into the cylinder-shaped MRI scanner, which contains the magnet. Your position may be adjusted using foam pads or straps. This will also help you to stay still. Your radiographer will make sure you’re comfortable and any equipment around you is in a safe place. You can expect to lie still for up to an hour or more. How long will depend on how much of your body is being scanned. A full body MRI scan will take much longer than an MRI brain scan. You’ll be told before your scan how long it’s likely to take. You’ll need to lie still, often with your hands at your sides, so you’ll be encouraged to close your eyes and relax as much as possible. You’ll usually have your MRI scan and go home on the same day. Your radiographer will operate the MRI scanner from behind a window. They’ll be able to see and hear you during the scan. They’ll talk to you regularly to reassure you and remind you to be as still as you can. They may ask you to hold your breath at certain times during the scan. You’ll be shown a buzzer to press if you need to talk to your radiographer. The MRI scanner is shaped like a tunnel and is open at either end so you won't be completely enclosed at any time. But if you’re claustrophobic, see our FAQ on claustrophobia and MRI scans below for more information. You may need to have a special dye (contrast medium) to give more detailed pictures of inside your body. This will be discussed with you before your scan. If you’re having this dye, it will be injected into a vein in your arm. An MRI scanner is very noisy and can make knocking or drilling sounds. This is the sound of the magnetic fields changing during the scan. Your radiographer will give you earplugs or headphones to wear and may play background music for you to listen to. An MRI scan is unlikely to make your body temperature rise but you might feel some warmth in the area of your body that’s being scanned. If you feel burning or discomfort in any part of your body during the test, tell the radiographer straight away. After your MRI scan, you’ll usually be able to go home when you feel ready. You should be able to go back to your normal routine immediately afterwards. If you have a sedative during the scan, it can temporarily affect your co-ordination and reasoning skills, so you must not drive, drink alcohol, operate machinery or sign legal documents for 24 hours afterwards. If you’re in any doubt about driving, contact your motor insurer so that you’re aware of their recommendations, and always follow your doctor’s advice. You will also need to arrange for someone to drive you home. A radiologist (a doctor who specialises in using imaging methods to diagnose medical conditions) will examine your MRI scans. The results will then be sent to the doctor who requested the test. You’ll have a follow-up appointment to find out the results. MRI scans are commonly performed and generally safe. However, in order to make an informed decision and give your consent, you need to be aware of the possible side-effects and the risk of complications of this procedure. Side-effects are the unwanted but mostly temporary effects you may get after having the test. You may feel slightly claustrophobic and uncomfortable from being inside the scanner. If you're worried about this, talk to your radiographer. Complications are when problems occur during or after the procedure. Most people aren't affected. An MRI is a very safe test and there are no known complications or side-effects from the magnetic field used during the scan. It's possible to have an allergic reaction to the contrast medium used, though this is very unlikely. If you have any itching or shortness of breath during the scan, tell your radiographer immediately. Medicines are available to treat the allergic reaction. The exact risks are specific to you and will differ for every person, so we haven't included statistics here. Ask your radiographer to explain how these risks apply to you. 1. Does an MRI affect tooth implants or fillings? Dentures, crowns, tooth implants or fillings shouldn’t stop you from having an MRI scan. But it’s important to let your radiographer know if you have any of these so they can make the right decision. Some tooth implants and crowns can affect the images produced by the MRI scanner if you’re having your head scanned. Some dental implants are made from ceramic, but others contain metal as well. If you’re not sure which material your dental implants are made from, check with your dentist before you go for an MRI scan. Most braces, especially newer ones, are safe if you’re having an MRI scan. But if you have removable dentures, implants or braces, you’ll be asked to remove these beforehand. If you have fixed devices, speak to your dentist as soon as you know you need an MRI scan. You may need to have some of the wires changed before you have the scan. 2. Will my claustrophobia stop me having an MRI scan? If you’re claustrophobic, you may still be able to have an MRI scan. MRI scanners are open at either end so you won't be completely enclosed at any time. There are several things your radiographer can do to make the scan easier for you. So if you're anxious about being in an enclosed space, contact the radiography department where you’re having your scan. You should do this when your appointment comes through rather than waiting until the day of your scan. This will give your radiographer enough time to make suitable arrangements to help you. You should also talk through what’s going to happen when you’re in the MRI scanner, so you can prepare yourself in advance. Your radiographer will be able to see and hear you during the scan. If you feel worried at any time during the scan, tell your radiographer straight away. You’ll be given a buzzer to press if you need to talk to them. The MRI scanner is very noisy, but the radiographer will give you earmuffs, headphones or earplugs to wear. Some hospitals play music to help you relax. A friend or relative may be able to sit with you during your scan. If so, they’ll also have to remove all their metal items. If your claustrophobia is very severe, speak to your doctor when they refer you for an MRI scan. They may be able to arrange for you to have a mild sedative before your scan. If you do have a sedative, you’ll need to arrange for someone to drive you home. Ideally, someone should also stay with you for the first 24 hours after your scan. If you're very anxious, you may be able to have your scan in an ‘open’ scanner. This is less enclosed than a conventional machine. However, these aren’t routinely available on the NHS. Availability will depend on the area where you live. This information was published by Bupa Group's Health Content Team and has been reviewed by appropriate medical or clinical professionals. To the best of their knowledge the information is current and based on reputable sources of medical evidence, however Bupa (Asia) Limited makes no representation or warranty as to the completeness or accuracy of the Content. The information on this page, and any information on third party websites referred to on this page, is provided as a guide only. It should not be relied upon as a substitute for professional medical advice, nor is it intended to be used for medical diagnosis or treatment. Bupa (Asia) Limited is not liable for any loss or damage you suffer arising out of the use of, or reliance on, the information. Third party websites are not owned or controlled by Bupa and any individual may be able to access and post messages on them. Bupa is not responsible for the content or availability of these third party websites. Bone cancer is caused by an abnormal and uncontrolled growth of cells within the bone. It can be benign or malignant.